The aim of this work is to evaluate the wind energy potential of two sites in the Ibiapaba Mountain situated in the Ceará State, Brazil. Techniques and parameters used for the assessment of wind energy in those sites are described and statistical analysis of wind speed and direction is performed in data collected of two meteorological stations. It was observed that the Ibiapaba Mountain presents significant wind energy potential and adequate to satisfy the demand for electricity at the region and consequently may be suitable to complement the energy matrix of the Ceará State. This paper deals with the study of the carbon/metal oxide composites synthesis for electrochemical capacitor electrode material. Transition metal salts, such as FeCl3 and TiCl3 act as activator in the synthesis of activated carbon from gelam wood sawdust (Melaleuca cajuputi Powell) which also have the functions as substrates for the composites. The surface functionalities of activated carbons were modified using oxidative treatments. The changes on crystallography and surface functionalities were analyzed based on XRD and FTIR data. The electrical conductivities and electrochemical properties were determined using kelvin and cyclic voltammetry methods, respectively. FTIR analyses showed that the activation and oxidation treatments affected their surface functionalities. The XRD analyses showed that oxidative treatments also affected carbons crystallite. The electrical conductivities and electrochemical properties were influenced by their crystallite and surface functionalities. The shape of the cyclic voltammograms varied according to the changes on the surface functionalities and on the metals loading. TEM analyses indicated the existence of nanoparticles metal oxides in the carbon samples. This article reviews the practice and implementation of international legislations in providing emergency housing in Malaysia. The objective is to highlight challenges and level of influence of international understanding in local circumstances. A consideration of appropriate and specific legal tools is beyond the scope of the guidelines provided by the international treaties. International guidelines only present the legal context for the implementation of emergency housing ‘responses’ and do not represent a law. The guidelines highlight some of the legal considerations that should be taken into account when planning settlement strategies, programmes and project matters. These guidelines outlined are based upon the consideration of law and human rights. It is important to reflect these guidelines on advocacy tool, to understand the socio-political in the context of regulatory awareness and also to understand the rights of affected groups in legal context. As a result, the disaster victims and other members of the general public are more concerned about the availability of resources to support life recovery, ignoring any weaknesses of the local government. At the scene of a disaster, officials are often caught in the middle between working with ethics and programmes’ implementation whilst they have failed to fulfill requests from the disaster victims and public. Hence, there is still a need to develop laws further, on both national and international levels, in order to deal with several aspects of emergency housing. Keywords: Domestic violence; Geospatial Information System; National Call Center; Information Technology. Domestic violence can involve men to women, men to children, women to children and sometimes women to men. Domestic violence in Kenya is mostly prevalent in middle-income and lower-income levels of the society. In this paper, a prototype system is implemented to administer and manage a national domestic violence call center. This is a GIS-based call center system supporting distress calls by: (i) automatically identifying callers’ locations, (ii) Quickly assessing accurate spatial information from its database about nearby advocate resources and reporting back to the caller, the identified advocate, and (iii) publishing maps in Keyhole Markup Language for viewing in software supporting open standards such as Google Earth. The system was validated using sample data collected from Juja location. This prototype shows promise of being able to offer rapid and timely responses to domestic violence (and other) distress requests utilizing geospatially enabled technologies. Coandã flows have been the study of aircraft designers primarily for the prospect of achieving higher lift coefficient wings. Recently the environmental problem of noise pollution attracted further interest on the matter. The approach used is numerical; the computations were made using a large eddy simulation (LES) technique coupled with a Ffowcs-Williams-Hawkings (FWH) acoustic analysis. The spectrum of the flow was measured at three locations in the vicinity of the ramp showing that the low frequency region is dominant. The findings may be used as reference for the development of quiet aircraft that use super-circulation, as it is the case with the Upper Surface Blown (USB) configurations. Pulsed Current Micro Plasma Arc welding (PCMPAW) process is an important joining process widely used in sheet metal fabrication industries. 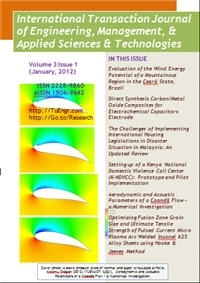 The paper focuses on developing mathematical models to predict grain size and ultimate tensile strength of pulsed current micro plasma arc welded Inconel 625 nickel alloy using Response Surface Method (RSM). The experiments were carried out based on Central Composite Design (CCD) with 31 combinations of experiments. The adequacy of the models is checked by Analysis of Variance (ANOVA) technique. Hooke and Jeeves method is used to minimize grain size and maximize the ultimate tensile strength.